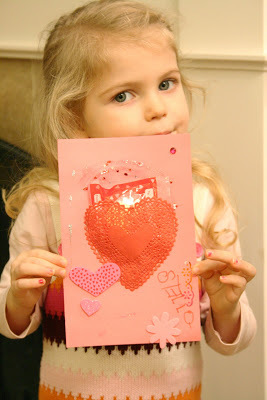 Stella decorated 16 Valentine cards for her classmates. I bought a ton of stickers, glittery glue, markers and heart paper dollies and she went to work. She was much more involved in the Valentine craft this year than last year. Emojis are everywhere lately, and they are SO cool among the kids these days. We just had to do some kind of valentine emoji pop-up card for all the boys in my life…and in yours! 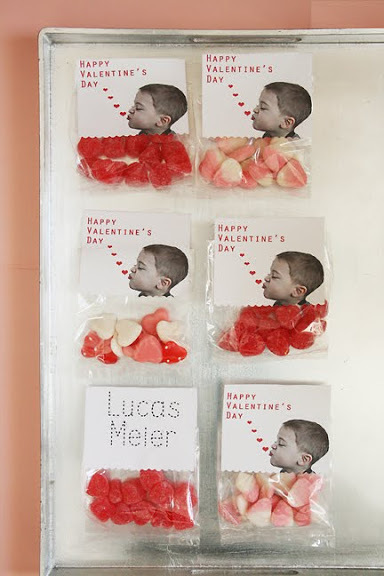 I hope you had a chance to check out this year’s girl valentines using honeycomb balls to creating a pop-up effect. We thought it would be a good idea to staying with the honeycomb pop-up theme and create one for the boys. These emoji valentine cards create a fun wow factor. We decided to use the cool man emoji and a pirate emoji. It was hard a picking, but these designs worked best for big eyes. Download the FREE VALENTINE EMOJI POP-Up Card after the jump. If you need instructions on the how-to, please refer back over to the original honey-comb pop up card. The download for the Valentine Emoji Pop Up card is right below. Here is the link to the 2″ black honeycomb balls. Have so much fun putting these together! We had a snow day yesterday, so the kids got busy working on Valentine’s cards. I gave Miss Stella a stack of blank cards and scrapbooking embellishments, and she decorated all 24 cards beautifully and with detail. Mr. Luke, on the other hand, puts up a fight if an art project takes longer than five minutes. What to do? I saw this card idea from a few different websites and thought it was a cute and minimal work for him but still keeps him involved. With posing for the picture and filling the candy bags, he was also happy to trace his name on all 13 cards. The font name is Trace and can be downloaded here. Valentine’s Day is one of my favorite holidays! Valentine’s Day, for me, is a celebration of LOVE. Love for each other, love for your spouse, love for your friends, love for your neighbors, love for your children. I really don’t think of Valentine’s Day as a romantic holiday, but more of a holiday for the love of mankind. So the giving of valentine cards and giving flowers is such a wonderful way to show a small gesture of love. Another reason why I love Valentine’s Day is because it was the day that my husband first took me out on a date. We were friends prior and hung out a lot on the ski slopes together, but Valentine’s Day was the first time he took me out on a real date. So the day holds a special place in my heart. Well, you may know by now that I usually go all out on decorations for holidays, but not really for Valentine’s. Although I do like to decorate on the day of Valentines Day like when we have our morning breakfast or have fun desserts in the evening. So the decorations are more on the day of or a few days prior, not all month long. I thought a good way to decorate by keeping it minimal is with a simple valentine bar cart that you can scoot around the house but keep all the red and pink hearts all in one spot. If you don’t have a bar cart and do a lot of entertaining, then I would suggest get yourself a bar cart! I use mine all the time and it’s so nice to have an area for drink mixing near a serving table or a lounge area. To style the bar cart, put all the drink mixers on the top shelf and use pie pedestals, pretty sturdy gift boxes and stands (or flip over a pretty plant pot) to create varying height. Place a vase of flowers or dessert yummies on those stands. Include on the top shelf drink stirrers and napkins. On the bottom shelf of a simple valentine bar cart, include more dessert valentine cookies or chocolates (whatever your sweet tooth wants). Place additional drink mixers on the bottom, if you are limited on top shelf space. You can also add a vase of flowers on the bottom if you weren’t able too on the top shelf. Then throw in a few random decorations around the items. Hang a garland if you’d like on your simple valentine bar cart. If the bar cart is up against a wall, I like to hang something above it to continue the visual height. I am still loving the modern wire wreaths (get the DIY), so I created one as a heart shape and added roses. So simple, yet elegant. When my children were little toddlers, and our daily schedule revolved around nap time, I would make an effort every Valentine morning to prepare a big breakfast with yummy homemade crepes, dutch babies, fresh fruit and a whole lot of yumminess all in the shape of hearts. Today we are a slave to the school schedule, so I’m lucky if my children eat any food in the morning. 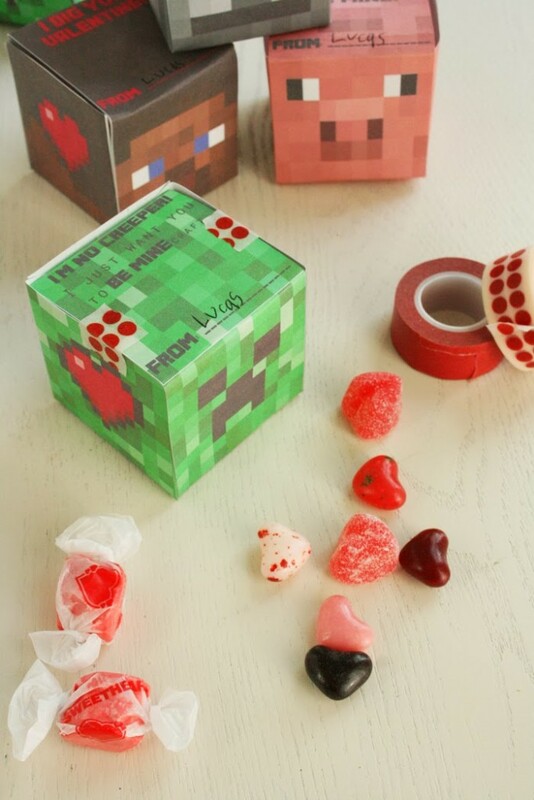 This Valentine’s, I’m planning to put a little effort in the morning of love day, because I (or more like my kids) miss all the fun we used to have. But I thought I’d share some easy Valentine’s Breakfast for Kids ideas for the busy mom (and child) morning schedule. These are easy breakfast ideas that take little planning. A little sprinkles goes a long way. Sprinkles just makes everything more prettier and happier. Right?! My kids love sprinkles and don’t usually have sprinkles in the morning! That is so against the house rules…but not on Valentine’s Day! Add little sprinkles to your child’s pancakes, waffles or morning cereal. They will love it! Next time you are at the grocery store, pick up a few pink or red sprinkles. Add a little pink or red food coloring. If you forgot to grab strawberry milk at the grocery store (I always forget to grab it), then Valentine’s Day morning drop a few red food coloring in your child’s morning milk. Or drop some in water and squeeze fresh lemon juice,add a little sugar and you’ve got instant pink lemonade. Your kids will love it! Pull out that Heart-shape cookie cutter. Heart-shaped food items are the best on Valentine’s Day. Cut hearts out of pancakes, waffles, toast, eggs and even sandwiches for an instant easy Valentine’s breakfast for kids. Serve strawberries, blueberries and raspberries. They are the colors for Valentine’s Day and are easy to throw on your plate and the best thing is they are healthy…and sweet. Prepare the night before. Make overnight french toast or overnight oatmeal or muffins. Pick up some doughnuts and just heat up to serve Valentine’s Day morning. Set the table the night before with your pretty china and tablecloth. Your kids will be so excited! During Valentine’s week, or really the month of February, I set up a little note-making station in the house where my kids can write notes of thanks, love to another family member or service they have done that month to another. We open them up on Valentine’s Day during breakfast and read them. My children love it and is a great way to bring love into the home! My children don’t get any gifts on Valentine’s day and really we don’t give gifts to each other, but instead we give the gift of love through serving each other or through expression. It’s fun to hold onto the notes and read them a year later. 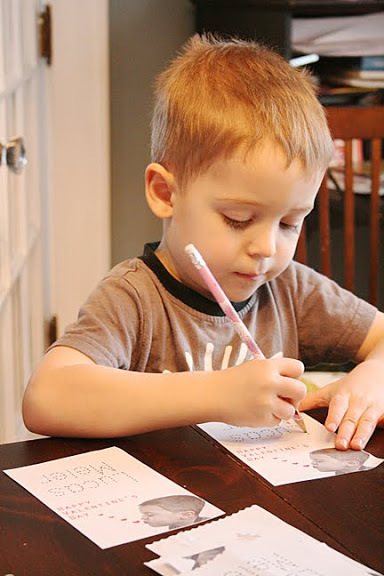 So, grab some pretty scrapbook paper, or notecards, markers and stickers and if you have the time this Valentine’s Day have your kids write one kind thing they have done for another or just a kind note to give to a friend or family member. It’s the perfect way to begin and end Valentine’s Day! We love to give out a good Valentine’s card in our home, and we really put in some thought into the cards each year (I linked some of our past year’s below). This year I wanted to do Valentines for girls, since last year’s Valentines were focused on my boys. I wanted to design something that my middle schooler daughter would love to give out to her girlfriends, and my kindergarten daughter would think was cute enough to give out to her classmates. Unicorns and flamingos came to my mind for my younger daughter; Pineapples and Cactuses for my older daughter. Of course the Valentines had to be interactive in some kind of why! That’s how we like it over here. I turned to Melissa’s Designs to execute my design ideas, and she watercolored these and whipped them out in just a few short hours. Serious art talent, and I’m so in love! 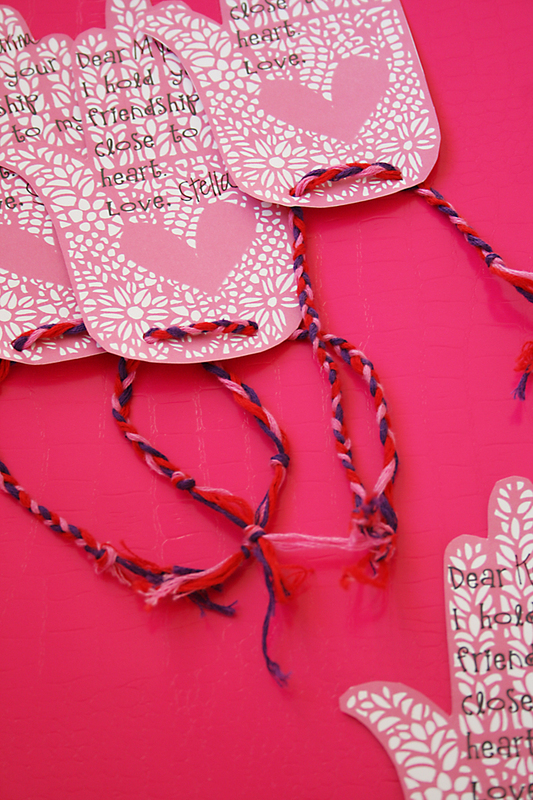 So grab a pair of scissors, handheld hole punch and some colorful brads. All you do is download then print on white card stock paper. Cut out the attachments, hole punch below (or to the side) of the words and hole punch the design attachment. Use a brad to attache to the valentines card. The FREE PRINTABLES are available for download below for these cute Valentines for Girls. I just ask that you share these with your friends and on Pinterest. 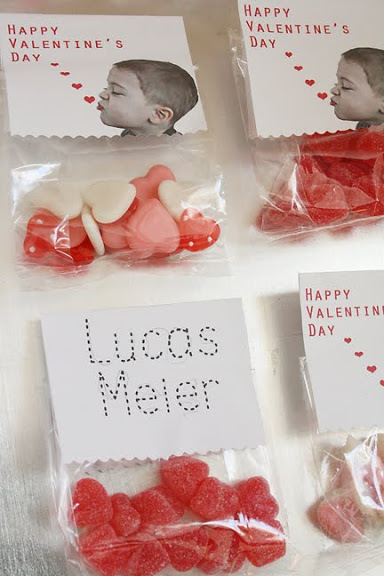 Attach the valentines to a bag of candy of non-candy item. And watch these valentines for girls be enjoyed and receive a few giggles! For Valentines this year, I knew my boys were going to want to hand out Star Wars Valentines to their classmates, especially Star Wars Valentines, The Force Awakens. Of course they would and probably most other boys. The show was definitely a favorite! So, I turned to my talented graphic designer friend Melissa to create a modern Star Wars valentines focused around the new movie. I’m excited to say that you’ll be seeing a lot more of Melissa’s work on Darling D. She is coming on to help me design printables and fun goodies for all you lovely readers! And this Star Wars Valentines is just one of them! With these Star Wars Valentines, we formatted the artwork on the left side so you can add a glow stick, sugar straw or other candy or toy to the right of it. We played up the light saber element of the movie, adding colored sugar straws, which I picked up at Park City, and attached with washi tape. Storm Trooper, Kylo Ren and BB-8 ruled this movie so they made it on the cover of our Star Wars Valentines! 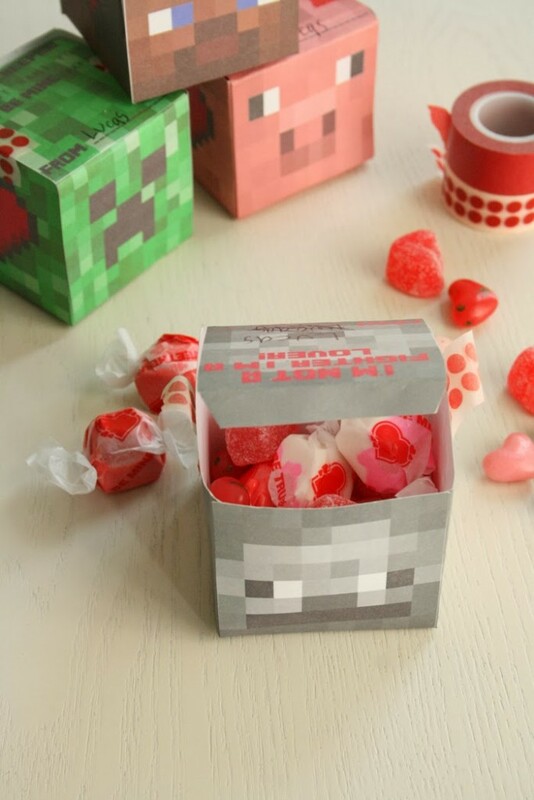 These are just other fun candy and toy ideas. I picked them all up at my local party store. The Star Wars toys were about 40 cents each so they are definitely doable for classroom valentines. Have fun printing these Star Wars Valentines out! Definitely print them on white cardstock and remember to pin and share! Here are some fun Star Wars items ! 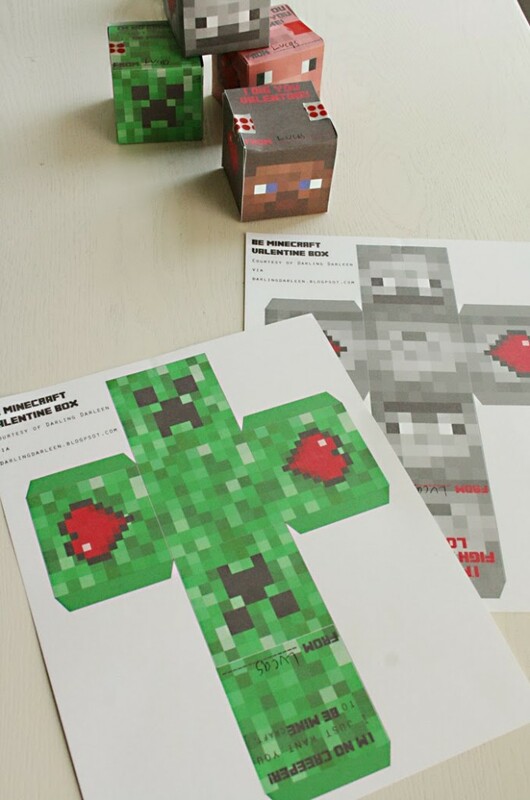 I never thought I’d be crafting up Minecraft Valentines for my two sons who are obsessed with the video game. They like it so much that I get them scrubbing toilets so they can play the game. Tough mom. Or I like to think smart mom. Anyway, my 2nd grader did not want to have ANYTHING to do with cutesy, lovey-dovey Valentine cards. He didn’t want any of the girls in his class to think he actually LIKED them…much less love them. And he wanted to be “cool” with his friends. 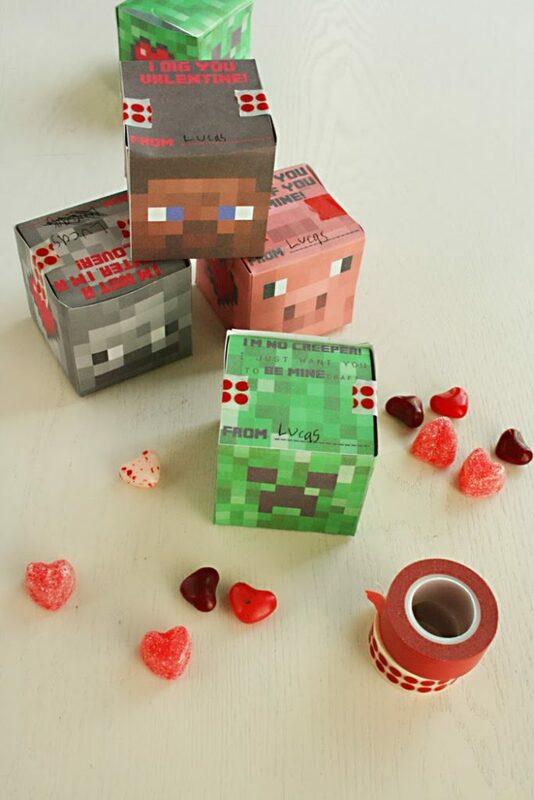 So we decided to do these 3-D cube Minecraft Valentine boxes. I have a feeling I might be reusing these boxes in the future for a birthday or something. 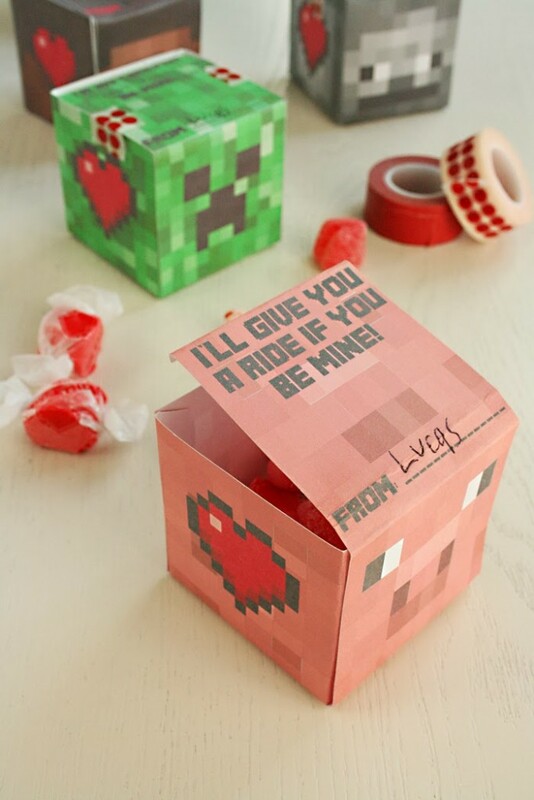 They came out has cute as Minecraft can be and are pretty useful. I was hoping to get this year’s valentines up last week but it was a hectic week, so here they are. I saw the friendship bracelet idea on pinterest and design mom and thought it would be perfect for Stella to do. She received a friendship bracelet making kit for christmas and has enjoyed making a few for her friends. But has felt underpressure to make one for ALL of her friends. So, giving them as Valentines was a perfect idea. We stuck with a simple braid to make the process go fast. 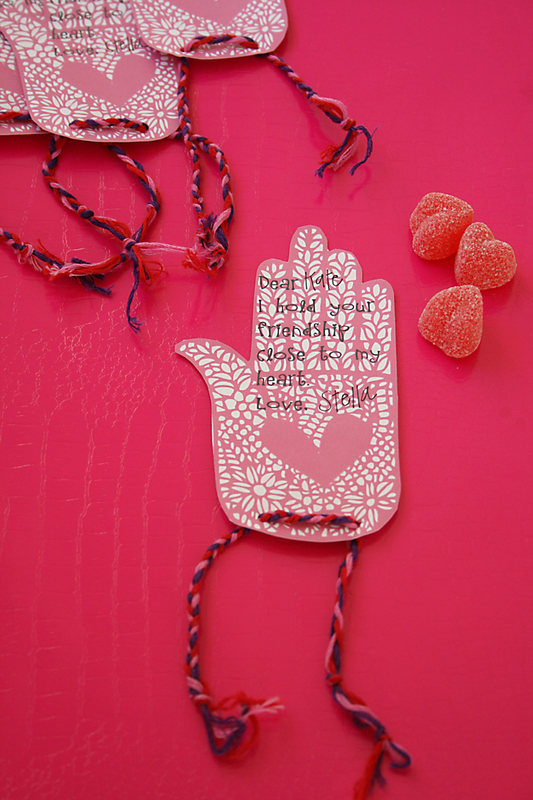 I love play on words for Valentine ﻿﻿﻿﻿cards and this phrase works perfect for the hand and friendship bracelet. Instructions: cut three different colors of embroidery thread about 12 inch long x 2–so there will be two 12 in. threads per each color. Tie all the threads in knot. Separate the threads in half. Put a pencil in between them and while holding the pencil tie another knot with all the threads together. So there will be a loop between two knots. Attach to the clipboard and start braiding. At the end, tie a large knot. To wear the bracelet, put the knot in the loop and it will stay secure. 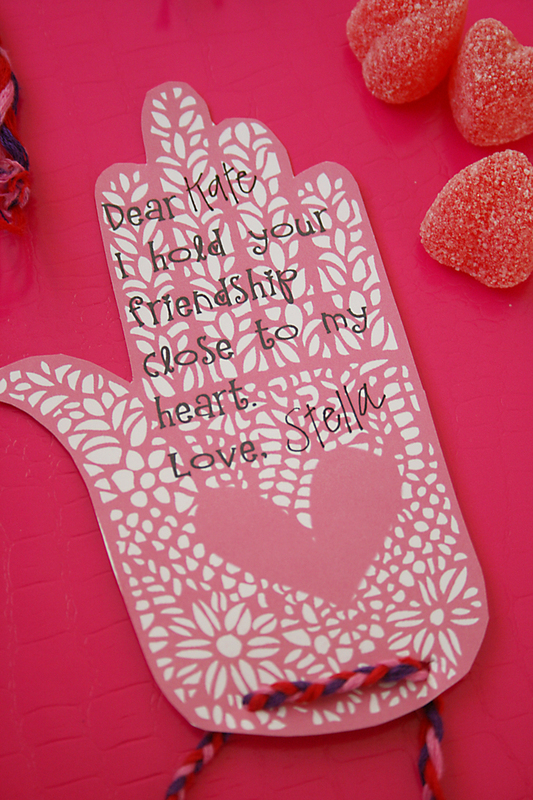 Print the friendship bracelet hand on white cardstock. Cut out each hand. Sign and put two hole punches at the bottom to hold the bracelet. We also got heart-shaped lollipops and secured them on the heart on the hand and in between the bracelet and the valentine.